Pay no attention to the woman in the back pages. 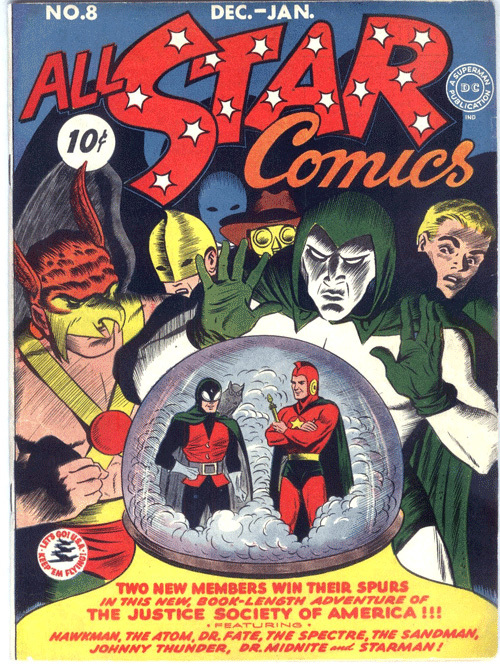 All Star Comics #8, DC Comics, December 1941-January 1942. 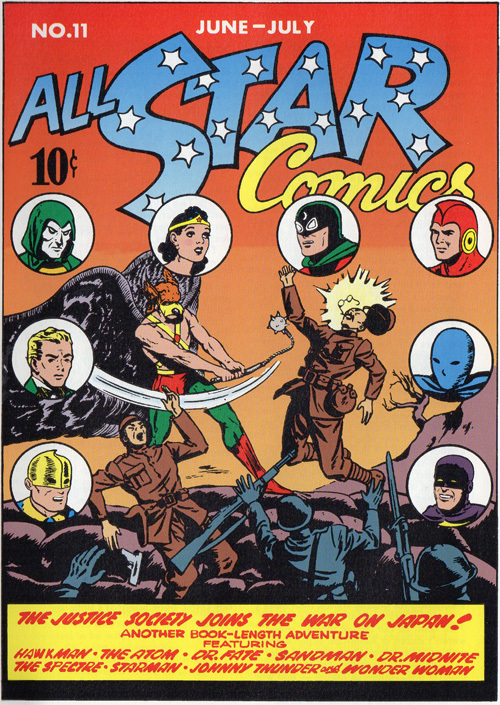 I’ve mentioned before that Wonder Woman’s very first appearance in All Star Comics #8 was almost hidden, apparently deemed unworthy of even a mention on the cover of the issue. In fact, the cover advertises a “new, book-length adventure of the Justice Society of America!! !,” strongly implying that there wasn’t going to be anything else in this issue. That’s led some to speculate that her origin story might have been a last-minute addition to the comic, originally intended for her splashy introduction in Sensation Comics #1 the following month. Seventy-three years later, it’s hard to know. 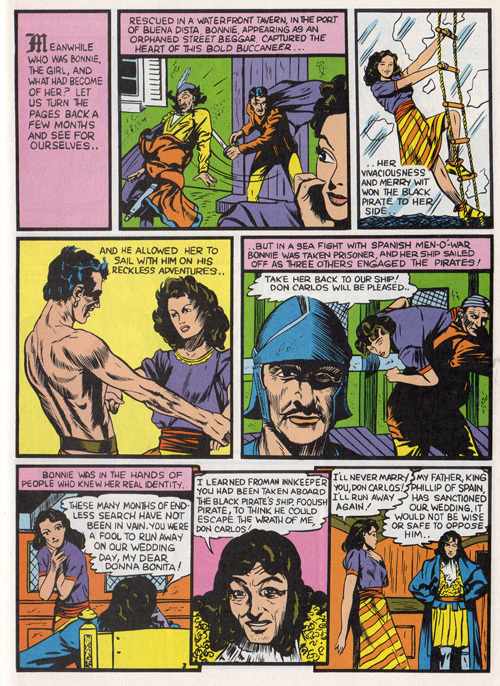 Certainly, most comics at the time featured several stories about several different characters. The format of All Star was unique at the time, as far as I can tell. Each issue was supposedly one big story about the Justice Society of America, the first super-team in comics. I say “supposedly” because the format was that they’d all get together and banter a little, then each member would go off and have a separate adventure, then they’d come back together at the end. Sometimes it was a question of reporting back on their individual exploits after the fact, but more often there was some uniting thread, such as the same mastermind being behind all the different crimes that each hero had to foil. But the point is, they seldom went off and fought as a team, or even paired up for strength in numbers. 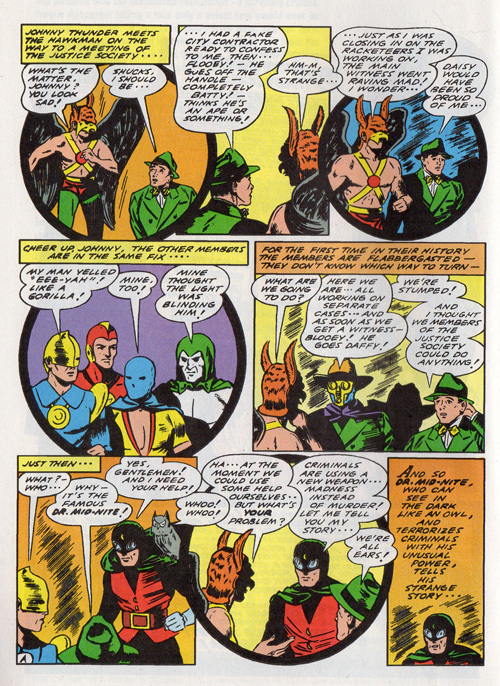 Every one of the heroes in the JSA was the star of solo adventures in other comics, although those with full-length comics of their own were taken off the active roster and became “honorary members.” (Batman and Superman had honorary status from the start, soon followed by Flash and Green Lantern.) 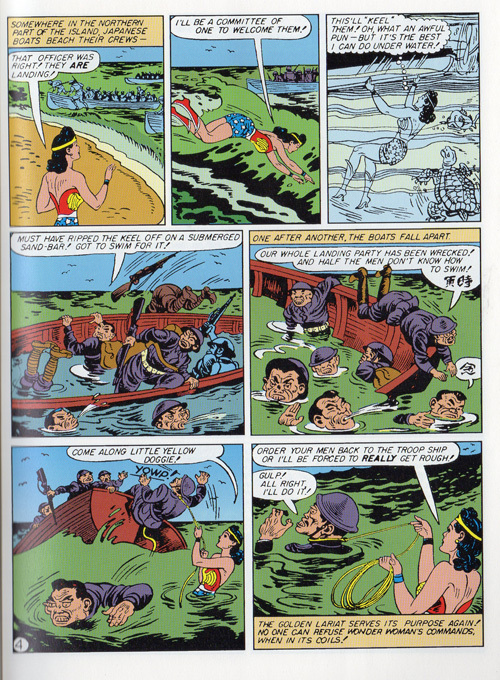 Oddly, Wonder Woman herself would later become an exception to that rule when she joined the JSA, continuing to appear in the series despite having her own Wonder Woman comic, but only because she acted as the team’s secretary more than an active member. Ah, sexism. The JSA stories were written by Gardner Fox, who later went on to create the similar and now better-known Justice League of America in the 1960s. But the cool thing about the JSA stories was that each hero’s adventure was written by that character’s usual artist from his solo series. (I say “his” because the only woman in the JSA was Wonder Woman, until Black Canary joined in 1948. Hawkgirl, who routinely joined Hawkman on his adventures, was never treated as a member.) Once each character’s few-page section finished, a plug appeared at the bottom of the page, telling you which comic to buy if you wanted to see that hero’s solo exploits on a regular basis. So what was the main story in All Star #8? 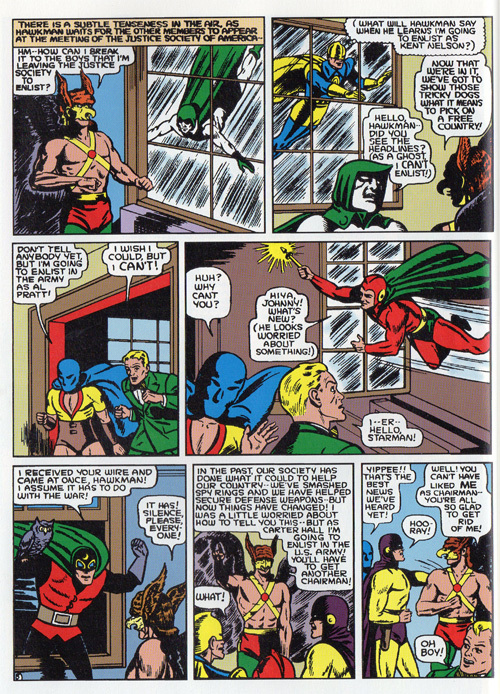 Well, this is the story where “two new members win their spurs.” Those are Starman, who had debuted in Adventure Comics #61 in April 1941, and Dr. Mid-Nite, who’d also been introduced that April in All-American Comics #25. They replaced Hourman and Green Lantern in the active JSA roster. The story itself is a somewhat confusing yarn in which the heroes foil a variety of blackmailers and small-time racketeers, whose only connection seems to be that they’re all using a serum developed by the mysterious Professor Elba to shut up potential witnesses by driving them insane. Provided with syringes of antidote by Mid-Nite, the heroes go off to bust the respective crimes that they’d already been investigating but had been flummoxed by key witnesses suddenly acting like gorillas. The crimes are strictly small potatoes, or at least not the sort of thing you’d normally expect superheroes to spend their time on: Mid-Nite fights political graft, the sorcerous Doctor Fate takes on a bus franchise racket, the Atom busts a jewelry syndicate, the Sandman investigates a photographer’s blackmail business, Starman and Hawkman fight slightly different (and totally separate) blackmail schemes, the Spectre breaks up a lottery racket, and Johnny Thunder foils fake cement peddlers. Fortunately, there’s no crime that can’t be solved by punching! And by terrible puns, apparently. Also, almost every adventure ends with someone yelling, “Keep ’em flying,” which always cracks me up. In the middle of the story is inserted a two-page text adventure of Hop Harrigan, aviator. And then of course, crammed in the back was the introduction of Wonder Woman, as invisible to the casual browser as her famous airplane. 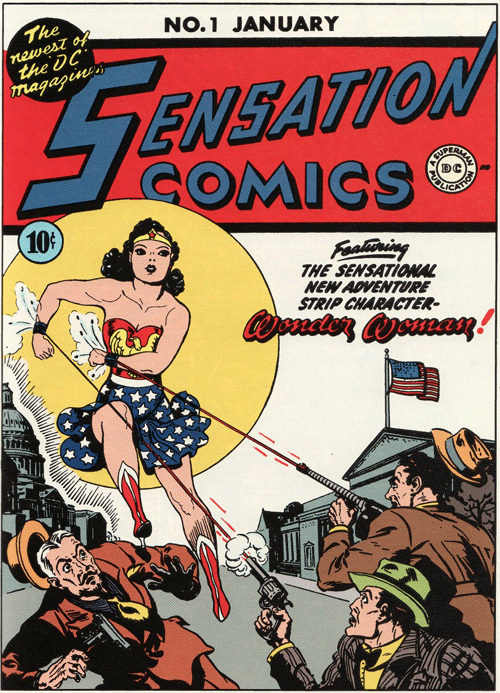 So what about Wondy’s splashier near-debut in Sensation Comics #1? That was also one of those anthology titles, wasn’t it? I’ve already written about the WW story up front, but what else was sharing those pages? 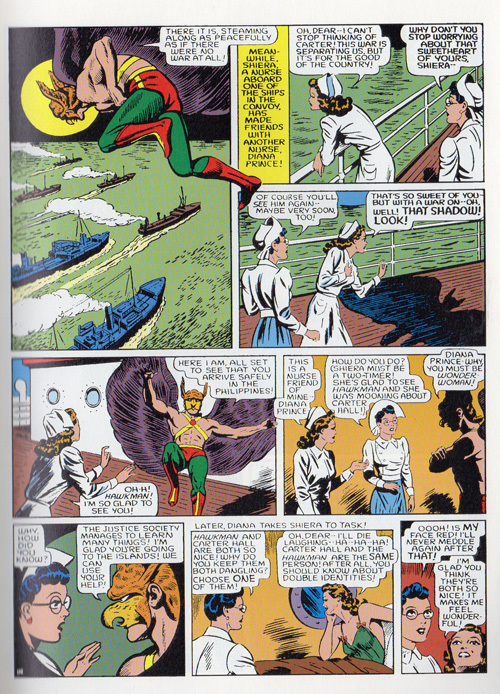 The second feature was the Black Pirate, a swashbuckling nautical feature that had been kicking around the back pages of various comics since 1940’s Action Comics #23, in stories by Gardner Fox and Sheldon Moldoff. The rest of the heroes were being introduced for the first time. One of the more fascinating was Mr. Terrific, who became a costumed hero essentially to keep from committing suicide because he was so tired of being good at everything. Mr. 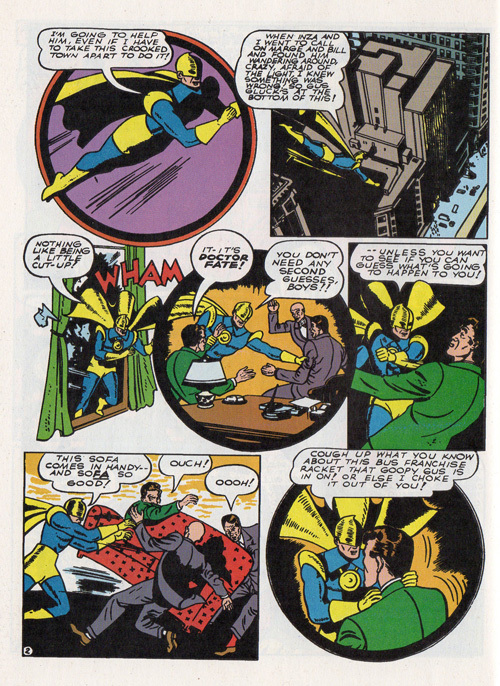 Terrific is best remembered today as a member of the JSA, a stint that originally only lasted for one issue of All Star in 1945. 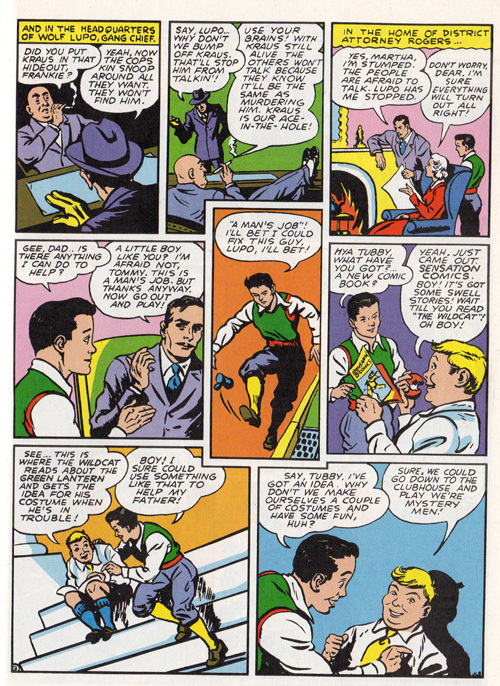 One thing that tickles me is that young Terry Sloan is told to “keep ’em flying” as a 10-year-old in Terrific’s origin story (by writer Charles Reizenstein and artist Hal Sharp), long before the slogan was supposedly coined in 1941. Created by Gardner Fox and artist Howard Purcell, the Gay Ghost was the swashbuckling ghost of an earl murdered by brigands in 18th-century Ireland, who waited around for centuries to be reunited with his reincarnated girlfriend. 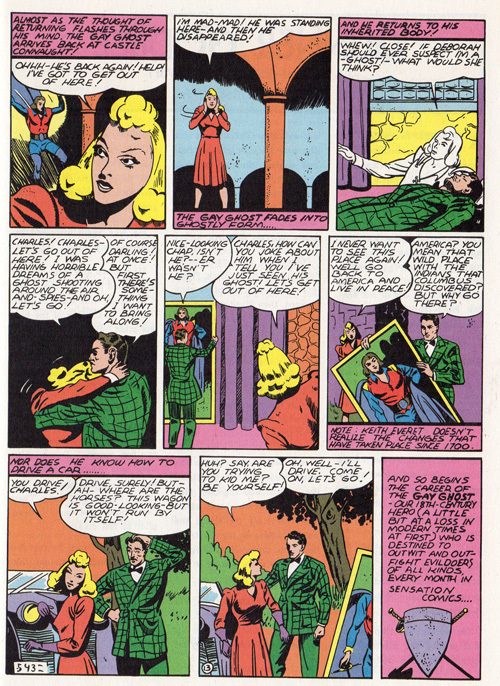 The setup is actually a little creepy: The 20th-century incarnation of his girlfriend of course doesn’t remember him and is terrified of his ghostly apparition, but he possesses the body of a male friend of hers, who unbeknownst to her has just been killed by mobsters. So now he’s just going to stalk her in the reanimated corpse of a dude she’s not into to begin with, hoping to wear down her resistance, while his ghost form continues to fight crime in his spare time. So creepy! She’s basically going to be living in a horror movie from now on. 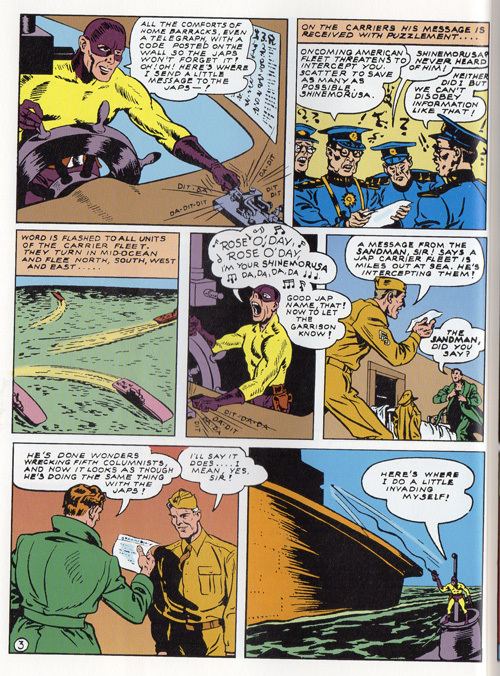 This issue also had a two-page text story about an aviator, this one about World War I flying ace Gunner Godbee, written by George S. Hurst. And believe it or not, this is where it gets weird. The next story introduces Little Boy Blue and the Blue Boys, three costumed crimefighters who are actually children, Tommy, Tubby and Toughy. But that’s not the weird part. In this first story by writer Bill Finger (the routinely uncredited cocreator of Batman, Robin, the Joker, Two-Face, et al.) 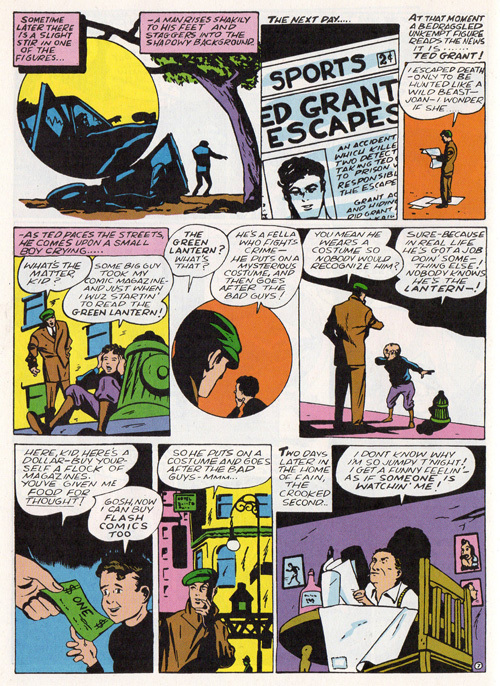 and artist Jon L. Blummer, little Tommy Rogers, son of a crusading district attorney, gets the idea of dressing up as a costumed character by reading a copy of Sensation Comics, in which Wildcat gets the idea to become a superhero from a Green Lantern comic. Mind you, that means that Tommy is reading the comic that he’s in right now. And not a previous issue or anything, because this is the first issue! And sure enough, in the very next story, also written by Finger (and drawn by Irwin Hasen), boxer Ted Grant—framed for the murder of his friend and mentor—gets the idea to become the costumed vigilante Wildcat from a Green Lantern comic. And he doesn’t even read the comic; some kid just tells him about it. I’m just glad I’m not the only one who based his life on comic books. 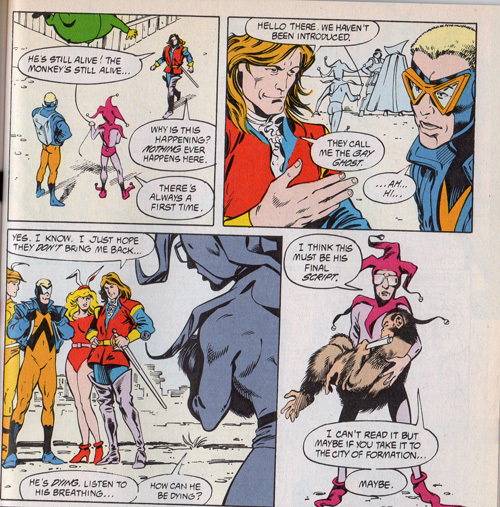 Wildcat would also later join the Justice Society–actually in the same issue of All Star in which Mr. Terrific joined–but only for two adventures. In depictions of the JSA in later decades, however, Wildcat was usually portrayed as one of the core members, at least until the New 52 reboot of 2011. Unfortunately there aren’t reprints of most of the run of Sensation Comics. DC has reprinted the entirety of the first issue a couple of times as a one-shot, but reprints of subsequent issues are limited only to the lead Wonder Woman stories—and even then, only up to issue 57 of a 116-issue run (which featured Wondy up through #106). I wish they’d take the Marvel route of reprinting some of these early anthology titles in their entirety, but DC’s more interested in character-specific collections. So let’s all hold our breath for The Gay Ghost Archives, shall we? Fortunately the whole run of All-Star Comics is collected in Archive editions (until it changed its name to All-Star Western with issue 58, anyway), because it was pretty much just Justice Society stories. But it wouldn’t be much of a Wonder Wednesday without Wonder Woman herself, would it? So let’s take a look at when Wondy joined the Justice Society! Oh yeah, brace yourself for some ethnic stereotypes. All Star Comics #11, DC Comics, June-July 1942. In this first story, however, she just happens to run into Hawkman and Hawkgirl, and gets involved with the team almost by osmosis. The whole story’s kind of adorable, actually. After the attack on Pearl Harbor, every member of the Justice Society spontaneously decides to enlist in the armed forces—except the Spectre, who’s bummed that he’s ineligible because he’s a ghost. The cute part is that each one is worried about telling everybody else that he’s enlisting, because they don’t want to let each other down. The joke is that Johnny can’t join the army because he’s joining the navy. Hawkman’s girlfriend, Shiera (alias Hawkgirl), has also enlisted as an army nurse, so of course she becomes pals with fellow nurse Diana Prince. 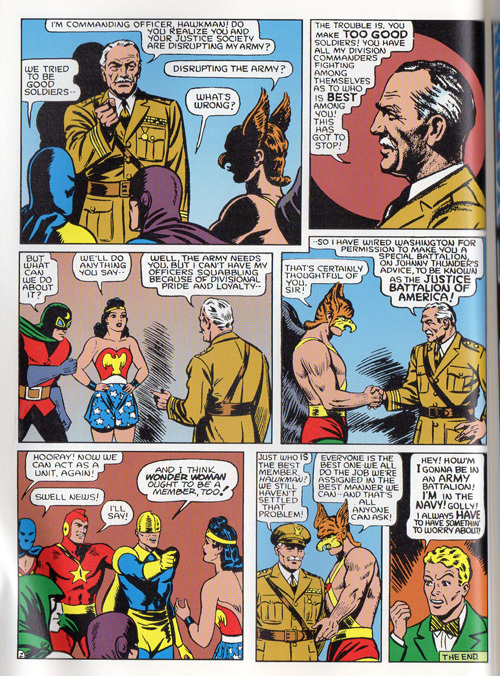 And Hawkman isn’t even subtle about the fact that JSA already knows that Diana is secretly Wonder Woman. Diana, on the other hand, can’t even put two and two together that Shiera’s boyfriend Carter must be Hawkman, and just thinks the winged hero must be Shiera’s extra guy on the side. Way to use that ol’ wisdom of Athena, Diana! 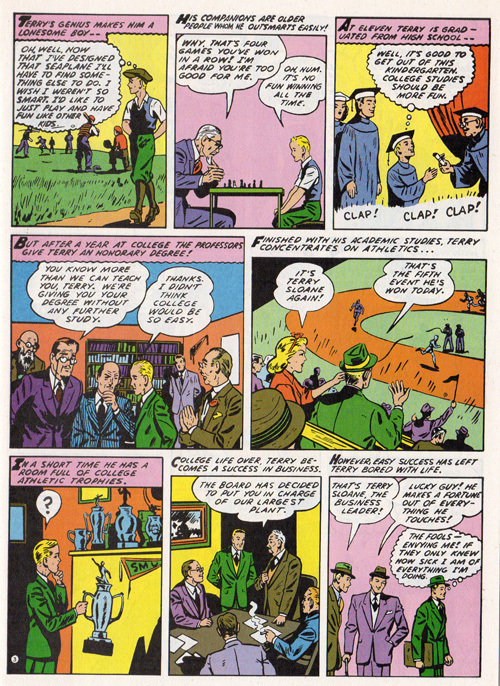 In her defense, though, I get the impression that Gardner Fox wasn’t all that into writing Wonder Woman. Because this story (or series of stories) is specifically about the JSA fighting the Japanese, we have some pretty egregious ethnic stereotypes throughout the story. Apologists love to rush in and say this isn’t racist because we were at war and it’s usual to depict the enemy grotesquely, but as eeeevil as Nazis were portrayed at the time, they still usually just looked like people, as opposed to the buckteethed golden gnomes that the Japanese were routinely caricatured as. Yeah, you can’t tell me that’s not racist as all hell. Art by H.G. Peter. As usual, each hero has a separate adventure drawn by his usual artist. In this case the common thread is that they’re all getting used to their new assignments in the armed forces and have to switch into their costumed personae to fight the Japanese. Since issue 8, the Sandman has changed from a gas-masked and trenchcoated mystery man to a spandex-clad action hero. This is the version of the Sandman that Captain America cocreators Joe Simon and Jack Kirby would soon work on, but they didn’t make the costume change. I don’t even know what’s going on right here. Art by Cliff Young. In the end, the JSA is told by the top brass that this thing of enlisting under their secret identities and leaping into action in costume isn’t going to work because they’re outshining the other soldiers, and their commanders are squabbling over who’s got the best hero working with them. So if they want to help the war effort, the best thing the Justice Society can do is work together as the Justice Battalion of America. You tell ’em, Doc Fate! Doctor Fate just comes out and says, “And I think Wonder Woman ought to be a member, too!” But everybody seems to ignore him. After all, war is man’s work!